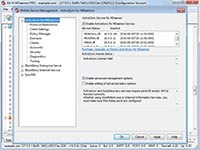 The initial setup requires an SSL connection and Windows 8 Mail requires a configuration of a Microsoft account first before any other account can be created. Start the following instructions after the Microsoft account has been added. Swipe left from the home screen. Tap Settings and then select Email and Accounts. Tap Add an Account and select Outlook. Email address: This is your full Email address (example: user01@example.com). Password: This is the password for your Email account. User name: This is your full Email address (example: user01@example.com). Domain: This is the part of your Email address after the @ sign (example: example.com). Server: The host name of the MDaemon server. (example: mail.examaple.com). 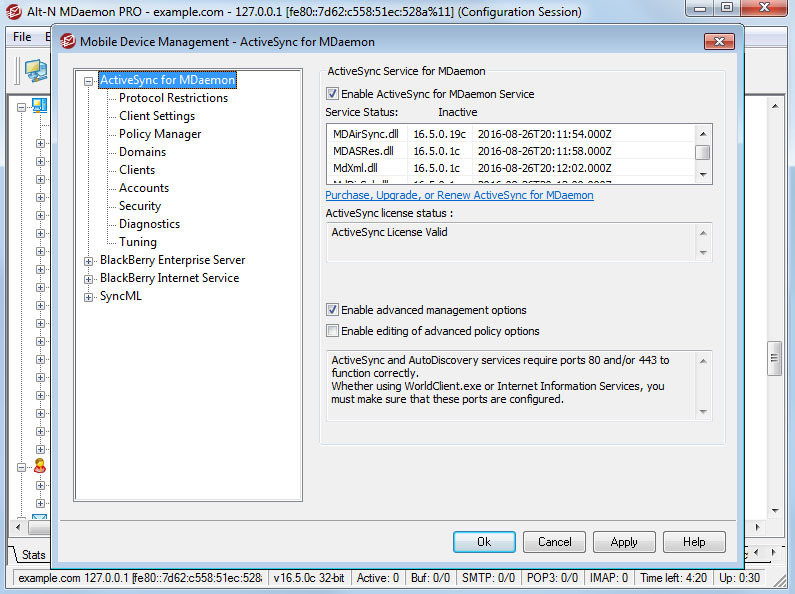 If you do not know your server name, see your MDaemon administrator. If the server requires a secure connection, then select the 'Server requires an encrypted (SSL) connection' box. Start ActiveSync on your device. Touch set up your device to sync with it. Enter your Email address (example: user01@example.com). 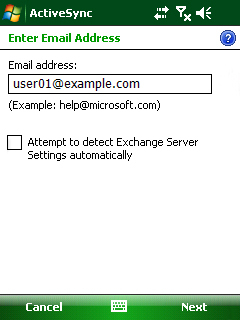 Uncheck Attempt to detect Exchange Server Settings automatically. Enter your Server address (example: domain123.example.com). Depending on your Webmail server settings (with or without SSL), you may need to uncheck The server requires an encrypted (SSL) connection (enabled by default on most devices). Click Ok. Enter User name: The 'mailbox' portion of your Email address (example: user01). Enter Password: Your Email password. Enter Domain: The 'domain' portion of your Email address (exmaple: example.com). Leave Save password selected to allow automatic synchronizations in the future. 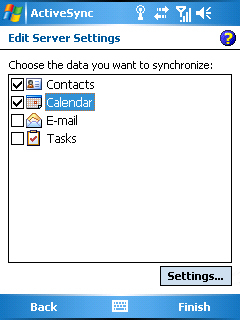 Check the box for each type of data you wish to sync (contacts, calendar, e-mail, tasks). Select the period of time you would like synchronized. The initial synchronization will start immediately. Wait for it to finish. Adjust peak times to fit your schedule. Note: The less frequently you synchronize, the longer your battery will last. Touch the X to close ActiveSync. Synchronizations will happen automatically in the background based on your schedule. User name: The 'mailbox' portion of your Email address (example: user01). Domain: The 'domain' portion of your Email address (example: example.com). Check Save password to allow automatic synchronizations in the future. Optional: If you would like to control the date range of the items synchronized with the mobile device. Select the period of time you would like synchronized from the 'Synchronize only the past' drop down menu. Note: The less often you synchronize, the longer your battery will last. Touch the X to close ActiveSync. Synchronizations will happen automatically in the background.